“If the phrase ‘I (heart) Boobies!’ appeared in isolation and not within the context of a legitimate, national breast cancer awareness campaign, the school district would have a much stronger argument,” Judge McLaughlin wrote. All the bracelets contained the web address of the foundation, which provides information on breast cancer detection and prevention, the judge noted. As far as the use of the term “boobies,” Judge McLaughlin concluded that rather than being a “lewd and vulgar” term, it simply matched its intended audience‘s vocabulary. 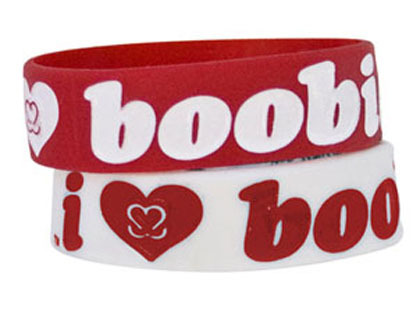 The bracelets were directed to a target audience of teenage girls, and the students testified that “boobies” is the word that they generally use to refer to their breasts. Thus, the phrase is a shorthand way of expressing the importance of breast cancer awareness and of breast health, the judge concluded.